These three strips [Peanuts, Pogo, and Krazy Kat] showed me the incredible possibilities of the cartoon medium, and I continue to find them inspiring. All these strips work on many levels, entertaining while they deal with other issues. These strips reflect uniquely personal views of the world, and we are richer for the artists’ visions. Reading these strips, we see life through new eyes, and maybe understand a little more – or at least appreciate a little more – some of the absurdities of our world. These strips are just three of my personal favorites, but they give us some idea of how good comics can be. They argue powerfully that comics can be vehicles for beautiful artwork and serious, intelligent expression. In a way, it’s surprising that comic strips have ever been that good. The comics were invented for commercial purposes. They were, and are, a graphic feature designed to help sell newspapers. Cartoonists work within severe space constraints on an inflexible deadline for a mass audience. That’s not the most conducive atmosphere for the production of great art, and of course many comic strips have been eminently dispensable. But more than occasionally, wonderful work has been produced. Amazingly, much of the best cartoon work was done early on in the medium’s history. The early cartoonists, with no path before them, produced work of such sophistication, wit, and beauty that it increasingly seems to me that cartoon evolution is working backward. Comic strips are moving toward a primordial goo rather than away from it. As a cartoonist, it’s a bit humiliating to read work that was done over 50 years ago and find it more imaginative than what any of us are doing now. We’ve lost many of the most precious qualities of comics. Most readers today have never seen the best comics of the past, so they don’t even know what they’re missing. Not only can comics be more than we’re getting today. but the comics already have been more than we’re getting today. The reader is being gypped and he doesn’t even know it. Some very good strips have been cheapened by licensing. Licensed products, of course, are incapable of capturing the subtleties of the original strip, and the merchandise can alter the public perception of the strip, especially when the merchandise is aimed at a younger audience than the strip is. The deeper concerns of some strips are ignored or condensed to fit the simple gag requirements of mugs and T-shirts. In addition, no one cartoonist has the time to write and draw a daily strip and do all the work of a licensing program. Inevitably, extra assistants and business people are required, and having so many cooks in the kitchen usually encourages a blandness to suit all tastes. Strips that once had integrity and heart become simply cute as the business moguls cash in. Once a lot of money and jobs are riding on the status quo, it gets harder to push the experiments and new directions that keep a strip vital. Characters lose their believability as they start endorsing major companies and lend their faces to bedsheets and boxer shorts. The appealing innocence and sincerity of cartoon characters is corrupted when they use those qualities to peddle products. One starts to question whether characters say things because they mean it or because their sentiments sell T-shirts and greeting cards. Licensing has made some cartoonists extremely wealthy, but at a considerable loss to the precious little world they created. I don’t buy the argument that licensing can go at full throttle without affecting the strip. Licensing has become a monster. Cartoonists have not been very good at recognizing it, and the syndicates don’t care. And then we have established cartoonists who have grown so cavalier about their jobs that they sign strips they haven’t written or drawn. Anonymous assistants do the work while the person getting the credit is out on the golf course. Aside from the fundamental dishonesty involved, these cartoonists again encourage the mistaken view that once the strip’s characters are invented, any facile hireling can churn out the material. In these strips, jokes are written by committee with the goal of not advancing the characters, but of keeping them exactly where they’ve always been. So long as the characters never develop, they’re utterly predictable, and hence, so easy to write that a committee can do it. The staff of illustrators has the same task: to keep each drawing so slick and perfect that it loses all trace of individual quirk. That way, no one can tell who’s doing it. It’s an assembly line production. It’s efficient, but it makes for mindless, repetitive, joyless comics. We need to see more creators taking pride in their craft, and doing the work they get paid for. If writing and drawing cartoons has become a burden for them, let’s see some early retirements and some room for new talent. – Bill Watterson, from his speech “The Cheapening Of Comics,” addressed to the Festival Of Cartoon Art, 1989. I recently watched the documentary Dear Mr. Watterson, and was immediately overwhelmed by a childhood’s worth of nostalgia and creative passion. The film is parts recollections on the personal impact of Calvin And Hobbes and part biography of the short and fascinating public life of Bill Watterson, a man shot to improbable fame before becoming a critic of his industry, retiring early, and successfully seeking reclusion. It’s a great film and it is available on Netflix among most other popular sources. Go watch it immediately if you find comic strips or artistic bios interesting in any way. The film observes two aspects of Watterson’s perspective that I see as really being opposite sides of the same coin. Watterson was a very vocal as a critique of licensing and the stranglehold syndicates required of cartoonists before the internet age. The other point I came away with was that comics have never been considered a legitimate or “high art” form, regardless of their innovations in scripting and illustration. These two problems seem to be really one and the same, as Watterson indicates. Comics were bred as a form of bizarro advertising. Think of them as visual editorial columns, intended to draw the eye and lure readers to commit to a certain competing newspaper through the use of staff illustrators. After a lot of natural evolution, the comics became individual artistic creations sold to multitudes of papers through syndications. This makes for a lot of odd standards as far as what relationships are considered normal. Watterson wanted integrity for comics as an art form, which was undermined completely by the continuation of their advertising roots. The art form quickly grew away from that starting point in a golden era but slowly waned back toward simple advertising through licensing when the money moved away from the papers themselves. 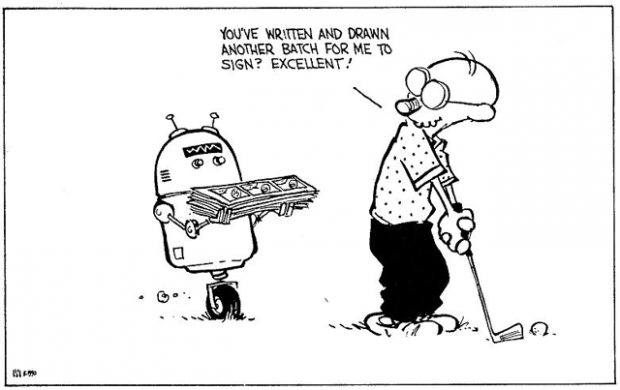 Watterson can feel a bit extreme in his condemnations at times, but he stands as a living example of exactly how much value a work can retain in itself when it doesn’t go to auction for the production lines. His tested his argument for himself and found greater success and finer work. The problem is how do you convince and entire industry to hold creative integrity over financial profit? Like many people, I found that what I was chasing wasn’t what I caught. I’ve wanted to be a cartoonist since I was old enough to read cartoons, and I never really thought about cartoons as being a business. It never occurred to me that a comic strip I created would be at the mercy of a bloodsucking corporate parasite called a syndicate, and that I’d be faced with countless ethical decisions masquerading as simple business decisions. To make a business decision, you don’t need much philosophy; all you need is greed, and maybe a little knowledge of how the game works. As my comic strip became popular, the pressure to capitalize on that popularity increased to the point where I was spending almost as much time screaming at executives as drawing. Cartoon merchandising is a $12 billion dollar a year industry and the syndicate understandably wanted a piece of that pie. But the more I though about what they wanted to do with my creation, the more inconsistent it seemed with the reasons I draw cartoons. Selling out is usually more a matter of buying in. Sell out, and you’re really buying into someone else’s system of values, rules and rewards. The so-called “opportunity” I faced would have meant giving up my individual voice for that of a money-grubbing corporation. It would have meant my purpose in writing was to sell things, not say things. My pride in craft would be sacrificed to the efficiency of mass production and the work of assistants. Authorship would become committee decision. Creativity would become work for pay. Art would turn into commerce. In short, money was supposed to supply all the meaning I’d need. You will find your own ethical dilemmas in all parts of your lives, both personal and professional. We all have different desires and needs, but if we don’t discover what we want from ourselves and what we stand for, we will live passively and unfulfilled. Sooner or later, we are all asked to compromise ourselves and the things we care about. We define ourselves by our actions. With each decision, we tell ourselves and the world who we are. Think about what you want out of this life, and recognize that there are many kinds of success. Many of you will be going on to law school, business school, medical school, or other graduate work, and you can expect the kind of starting salary that, with luck, will allow you to pay off your own tuition debts within your own lifetime. But having an enviable career is one thing, and being a happy person is another. Creating a life that reflects your values and satisfies your soul is a rare achievement. In a culture that relentlessly promotes avarice and excess as the good life, a person happy doing his own work is usually considered an eccentric, if not a subversive. Ambition is only understood if it’s to rise to the top of some imaginary ladder of success. Someone who takes an undemanding job because it affords him the time to pursue other interests and activities is considered a flake. A person who abandons a career in order to stay home and raise children is considered not to be living up to his potential-as if a job title and salary are the sole measure of human worth. You’ll be told in a hundred ways, some subtle and some not, to keep climbing, and never be satisfied with where you are, who you are, and what you’re doing. There are a million ways to sell yourself out, and I guarantee you’ll hear about them. To invent your own life’s meaning is not easy, but it’s still allowed, and I think you’ll be happier for the trouble. In this age, comics are no longer part of an arts minority that deals closely with business. In there heyday, and still to come extent when this speech was written, comics and animation occupied a unique space closer to advertising. Today almost any artist in any medium, be it musical, visual, or otherwise, is encouraged to sell an image apart from the art itself. In such an interactive age, we have a hard time latching on to anything that isn’t heavily pitched and surrounded by positive reinforcements like ads and personalities. Artists like Banksy and Shepard Fairey have advanced graffiti as George Herriman and Winsor McCay advanced cartooning, bringing something seemingly overlookable to an inspiring level of creative genius. Graffiti is all the more potent, a form that is in itself a satire and push back against the dizzying advertising seen everywhere today. The documentary “Exit Through The Gift Shop” shows just how difficult it can be to keep motivations straight when fame and fortune lies in the route of getting famous by decrying the age of adventising. For Bill Watterson to proclaim that there is a “good life” available that is strategically lesser in material contents and governed firstly by ethics and second by personality and skill really splits the crowd. I can think of a good number of people I know who I would expect to respond to this type of thinking with a “but can’t we be ethical while climbing ladders and gaining affluence?” Sure, I suppose you can try, but you only get one go at it. Keep your eyes open, and good luck! In the middle of my sophomore year at Kenyon, I decided to paint a copy of Michelangelo’s “Creation of Adam” from the Sistine Chapel on the ceiling of my dorm room. By standing on a chair, I could reach the ceiling, and I taped off a section, made a grid, and started to copy the picture from my art history book. Working with your arm over your head is hard work, so a few of my more ingenious friends rigged up a scaffold for me by stacking two chairs on my bed, and laying the table from the hall lounge across the chairs and over to the top of my closet. By climbing up onto my bed and up the chairs, I could hoist myself onto the table, and lie in relative comfort two feet under my painting. My roommate would then hand up my paints, and I could work for several hours at a stretch. The picture took me months to do, and in fact, I didn’t finish the work until very near the end of the school year. I wasn’t much of a painter then, but what the work lacked in color sense and technical flourish, it gained in the incongruity of having a High Renaissance masterpiece in a college dorm that had the unmistakable odor of old beer cans and older laundry. The painting lent an air of cosmic grandeur to my room, and it seemed to put life into a larger perspective. Those boring, flowery English poets didn’t seem quite so important, when right above my head God was transmitting the spark of life to man. My friends and I liked the finished painting so much in fact, that we decided I should ask permission to do it. As you might expect, the housing director was curious to know why I wanted to paint this elaborate picture on my ceiling a few weeks before school let out. Well, you don’t get to be a sophomore at Kenyon without learning how to fabricate ideas you never had, but I guess it was obvious that my idea was being proposed retroactively. It ended up that I was allowed to paint the picture, so long as I painted over it and returned the ceiling to normal at the end of the year. And that’s what I did. Despite the futility of the whole episode, my fondest memories of college are times like these, where things were done out of some inexplicable inner imperative, rather than because the work was demanded. Clearly, I never spent as much time or work on any authorized art project, or any poli sci paper, as I spent on this one act of vandalism. It’s surprising how hard we’ll work when the work is done just for ourselves. And with all due respect to John Stuart Mill, maybe utilitarianism is overrated. If I’ve learned one thing from being a cartoonist, it’s how important playing is to creativity and happiness. My job is essentially to come up with 365 ideas a year. If you ever want to find out just how uninteresting you really are, get a job where the quality and frequency of your thoughts determine your livelihood. I’ve found that the only way I can keep writing every day, year after year, is to let my mind wander into new territories. To do that, I’ve had to cultivate a kind of mental playfulness. We’re not really taught how to recreate constructively. We need to do more than find diversions; we need to restore and expand ourselves. Our idea of relaxing is all too often to plop down in front of the television set and let its pandering idiocy liquefy our brains. Shutting off the thought process is not rejuvenating; the mind is like a car battery-it recharges by running. You may be surprised to find how quickly daily routine and the demands of “just getting by” absorb your waking hours. You may be surprised to find how quickly you start to see your politics and religion become matters of habit rather than thought and inquiry. You may be surprised to find how quickly you start to see your life in terms of other people’s expectations rather than issues. You may be surprised to find out how quickly reading a good book sounds like a luxury. At school, new ideas are thrust at you every day. Out in the world, you’ll have to find the inner motivation to search for new ideas on your own. With any luck at all, you’ll never need to take an idea and squeeze a punchline out of it, but as bright, creative people, you’ll be called upon to generate ideas and solutions all your lives. Letting your mind play is the best way to solve problems. For me, it’s been liberating to put myself in the mind of a fictitious six year-old each day, and rediscover my own curiosity. I’ve been amazed at how one ideas leads to others if I allow my mind to play and wander. I know a lot about dinosaurs now, and the information has helped me out of quite a few deadlines. A playful mind is inquisitive, and learning is fun. If you indulge your natural curiosity and retain a sense of fun in new experience, I think you’ll find it functions as a sort of shock absorber for the bumpy road ahead. – Bill Watterson, excerpt from his commencement speech at Kenyon College, class of 1990. There are a thousand engaging reasons to love Calvin And Hobbes, but I find it is Watterson’s deep rooted sense of play that creates the transcending and nearly universal connection with readers. For all his shenanigans and misfittedness, Calvin is a kid who cherishes a passion for play and an untamable imagination. Anyone who has ever felt inspired by creativity or learning or the great outdoors can’t help but relate to what fuels this kid. 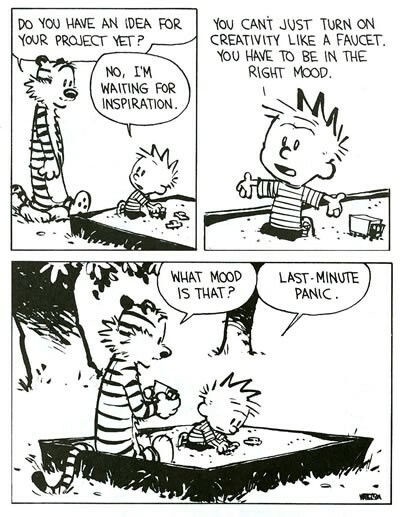 While I’m not sure to what degree Watterson self-identifies with Calvin, he definitely pulled what he personally needed to maintain creativity in his daily life into the central theme of his strip. I find that the most relatable creations are often like this one, so intimately human that they defy succinct explanation. C.S. Lewis And Lilith: What Does Blending Myths Do For You? C.S. Lewis And J.R.R. Tolkien: "The Strength Of The Hills Is Not Ours"
PAN & PUCK AVAILABLE NOW! Book Cover Art Release Date! I read, I write, I watch things grow. Fond of a good story. Living a great story. Please feel free to quote, share, and cite any and everything you see here.